Hello, Mr. Hansen. This is Adam Pagnucco. I am working with a group of folks who are advocating for Delegate Bill Frick’s legislation to allow competition in the county’s alcohol industry. I am in receipt of the attached flyer which I understand is being distributed in county liquor stores. The flyer is unquestionably a political communication and not a commercial advertisement. As the County Attorney, here is my question to you. If the county is using its facilities to distribute political speech, as it did with the Ride On buses, can county citizens with a different point of view use those same facilities to also distribute political speech? In other words, can we request that our flyers be distributed along with the county’s flyers? 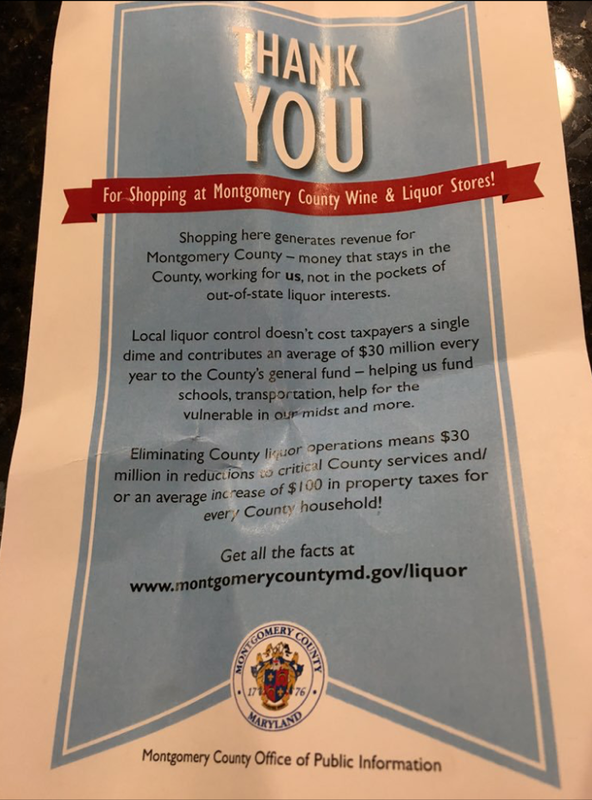 It looks bad that the County has had time to arrange to get these fliers into county owned liquor stores even as the Department of Liquor Control caused a major snafu with delivery screw-ups in the week before New Year’s Eve.